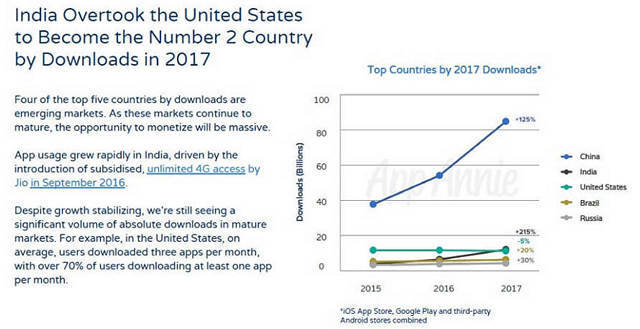 In its latest report about the global app ecosystem, App Annie claims that India has gone past the US to become the country with the second-highest number of app downloads. The report, titled “2017 Retrospective: A Monumental Year for the App Economy”, also says that China retained the number one spot on the list last year. Globally, there was a 60% growth in the number of app downloads around the world in 2017, with total downloads exceeding 175 billion across all mobile platforms. Consumer spend on apps reportedly increased by an even more impressive margin, hitting the $86 billion mark, which represents a 105% growth over the amount spend in 2015. The report also says that time spent in-app increased 30% last year, with each user now said to spend 43 days per year in apps. According to the report, the countries that downloaded the most apps also spend the most on apps, although, the rankings were slightly different this time around. However, the top markets by consumer spend all have one thing in common – they all posted double-digit growth during 2017, with China, the U.S., India, Brazil and Russia growing 270%, 75%, 60%, 80% and 35% respectively in terms of how much they spent on apps during last year. Also interesting are the patterns represented by some of the apps you don’t see on the list. With inexpensive mobile data now available in the plentiful thanks to Reliance Jio, homegrown video streaming app Hotstar has apparently become one of the most used apps in its category around the world. However, it is global heavyweight Netflix that is minting money in the country, having become the app with the highest consumer spend in the country. Another app on which Indians seem to have spend quite a bit on is Tinder, the infamous hookup app that is increasingly gaining popularity in the country with an growing number of singletons living away from their families in major employment hubs like Bangalore, Delhi and Mumbai.